For worry free vacations there is no better holiday destination then the Island of Phuket. It doesn't matter if you're travelling alone or with a group of friends or with your kids. We have found the Island to be one of the best family vacation spots where you can enjoy safe and memorable holidays. Phuket is one of the most well known tourist destinations in Thailand and over the years the Island has been transformed into a major tourist centre with well equipped infrastructure and services to accommodate millions of tourists from around the world. Today, Phuket has a large number of world class hospitals and services available and many tourists are choosing to have medical and dental procedures while holidaying in Phuket. Whilst nobody wants to get sick on holidays it is good to know that if you do there is good quality medical facilities available if required. When planning your vacation to Phuket, there are a few things you need to do prior to departing, which will ensure that you and your family will enjoy worry free vacations in Phuket. 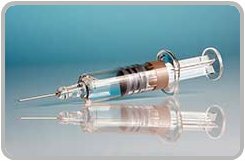 When travelling to Phuket, ensure that you consult with your Doctor about 8 weeks before your trip to find out what vaccinations you will require or if you need to have booster shots for. One of the biggest tips we can give you for worry free vacations is to ensure that you take out adequate travel insurance as soon as possible after you book your flights. Things can go wrong and accidents can happen on holidays, so it is best to be well protected if they do. Make sure that you check what the insurance policy covers you for, as not all policies are the same. Ensure that your passport is valid for at least 6 months beyond your intended length of stay. Thai Visas are subject to constant change; and some countries are exempt from visa requirements when entering Thailand for tourism purposes. It is advisable to check with your local Thai Embassy or Consulate to be certain that you are up to date with the current regulations. We always take with us a photocopy of our passport, insurance details and policy number as well as emergency contact numbers. We keep these copies in a safe place but separate to the originals. Phuket is generally a safe place for tourists; however as with anywhere in the world, there are dangers to look out for. Some of the crimes that affect tourists are pick pocketing or theft from hotel rooms. Only carry what money you need and put all your travel documents and valuables in the hotel safe. Like most countries credit card fraud is a problem in Thailand, only use your credit card at reputable establishments and check your statements on the internet regularly, there a many places in Phuket that have free WiFi. If possible try to avoid using credit cards. Beware of timeshare touts, they will approach you with scratches and you will always be a winner, the prizes range from T shirts to holidays. Before they give you your prize you will have to sit through a timeshare presentation which can take anywhere from 1 to 3 hours, not the best way to spend your much awaited holiday vacation in Phuket. When holidaying in Phuket if you have any concerns contact the Phuket Tourist Police, they are located in all major tourist areas and are there to assist foreign visitors. The beaches in Phuket throughout the high season are calm and crystal clear. However from May through to October during the southwest monsoon season the beach conditions can become dangerous. There can be heavy swells and shifting sandbanks and caution needs to be taken. Along most beaches you will see signs and flags warning people not to go in the water when it is dangerous. Unfortunately, some people either choose to ignore the warnings or don't understand what the signs and flags mean and consequently there are many tourist drownings on Phuket beaches year after year. 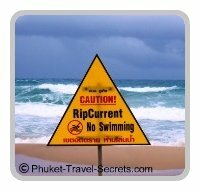 Red Flags are posted on Phuket beaches to warn swimmers of riptides and other dangerous conditions. 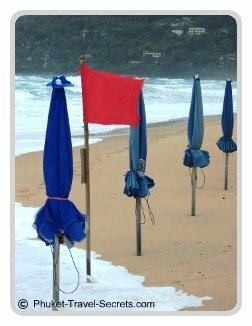 If a red flag is flying at the beach, don’t go in the water. 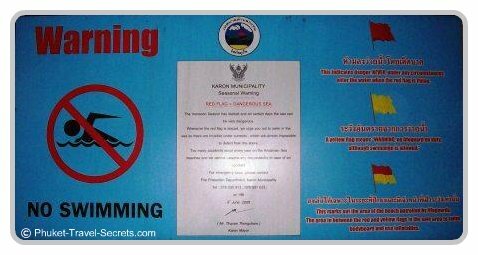 Below is another example of the signs that are displayed along the beaches in Phuket. When swimming and snorkeling on the beaches and offshore Islands around Phuket always be on the look out for jet skis and speedboats. Don't go swimming if you are under the influence of alcohol. Stay safe and always check conditions carefully and swim with caution. If you decide to hire a car or motorbike to get around the Island, you will need to be extremely cautious. Road accidents are the major cause of death to foreign tourists in Thailand, with motorbike accidents being the most common cause of death in Phuket. Always wear a helmet if you choose to ride a motorbike in Phuket keep in mind that when it rains the roads can become extremely dangerous. Ensure that your travel insurance policy covers you for riding a motorbike. Upset stomach is the most common problem for visitors to Phuket, this is usually quite mild but it can be enough to spoil your holiday. To avoid getting an upset stomach there are a few simple things you can do to prevent it, allowing you to relax and enjoy a worry free vacation. Dengue fever has been on the increase in Phuket and it is advisable to use mosquito repellent. 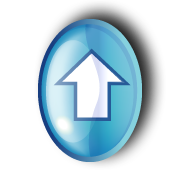 This should be used throughout the day as well as in the late afternoon and night. The dengue carrying mosquito, Aedes aegypti, is most active during the day, in particular at dawn and dusk. The risk of dengue fever is higher during the rainy season from May to October. Dehydration is one of the most common complaints in Phuket. This is usually caused by sitting in the hot sun and drinking to much alcohol and not enough water. Parents will enjoy worry free vacations in Phuket with the kids no matter what their age. The local Thai's adore children, and they will go out of their way to make your kids feel special. At first the amount of attention that the locals give the kids, maybe a bit overwhelming for the child, however after a few days the kids will become accustomed to it. One of the greatest dangers for kids in Phuket is the traffic, always keep an eye on the kids when out and about. Another problem is that car seats are not required by law for babies and toddlers, however some car rental companies do provide them if requested. For worry free vacations and the safety of your child you may want to bring your own. Throughout the Island you will notice lots of stray dogs wandering around, most of these dogs are not dangerous but when travelling with kids in Phuket, it is advisable to keep the kids well away from the dogs. Dogs can be unpredictable, especially around small children. Rabies is very rare, however there are a few cases in Thailand each year. Whilst most adults love trying the local Thai food in Phuket, some of the spices that are used to cook these delicious meals might be to strong for the kids. Most restaurants in Phuket provide western style food that the kids will enjoy and most importantly you want these restaurants to be clean and hygienic, keep an eye out for signs saying "Good Taste, Clean Food" these signs mean that the restaurant has passed a health inspection. For totally worry free vacations when travelling to any foreign country always check for travel advice and warnings from your local Government.